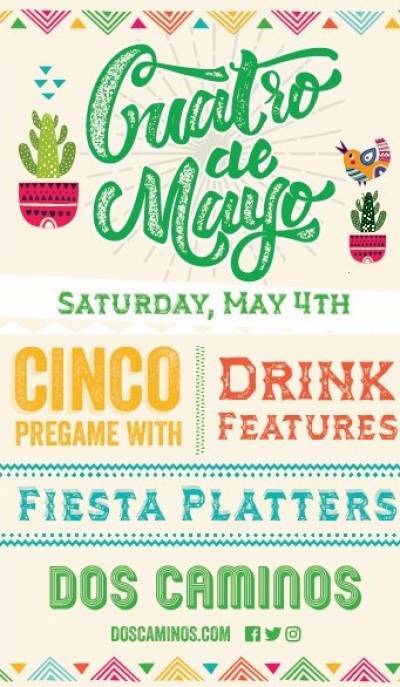 Get the Party Started Early this Year with Cuarto de Mayo at Dos Caminos! NYC’s Dos Caminos locations are getting the party started early this year by kicking of Cuarto de Mayo with a fiesta to get ready for Cinco de Mayo. On May 4th, enjoy special drinks including Con Tradición, Rosarita’s Revenge and Buckets of Beer, while chowing down on fiesta party platters curated by Executive Head Chef and Hell’s Kitchen winner, Chef Ariel Fox, which include an array of favorites like jalapeno poppers, tamale dumplings, poblano quesadillas, and more. For more information and menu specials, click here: https://www.doscaminos.com/cinco-de-mayo/. Check out Dates for: Get the Party Started Early this Year with Cuarto de Mayo at Dos Caminos!